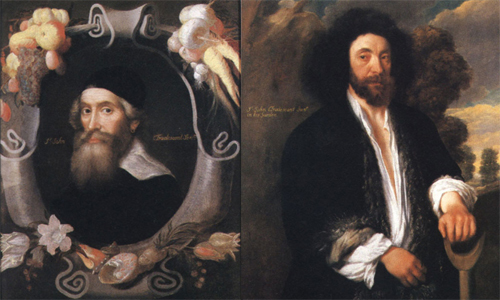 John Tradescant the elder and his son, also John, were famous gardeners to King Charles I and Henrietta Maria, making gardens at the Queen’s House, Greenwich, designed by Inigo Jones, from 1638 to 1642, when the Queen fled the Civil War. They were renowned for the plants they brought back to England from their travels all over the globe, including to Russia, North Africa, and North America. They had a botanical garden, alongside their museum at their home in Lambeth where they gathered their plants. St-Mary-at-Lambeth was their local church where they would have worshipped. 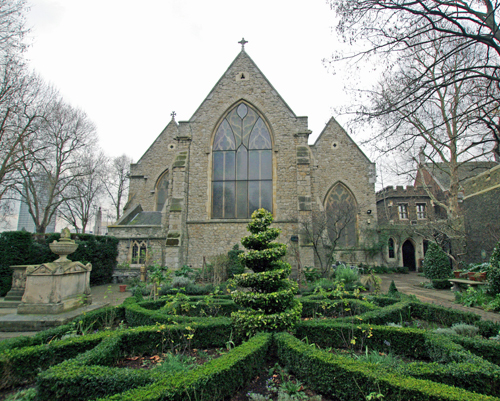 The church has been deconsecrated and is now the Garden Museum. 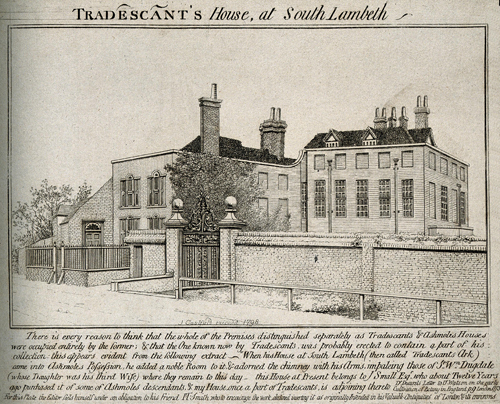 The Tradescants created an Ark, or museum, which was known as the Musaeum Tradescantianum, to show off their collection of artefacts which they had picked up on their travels, or acquired from the many wealthy patrons, merchant ships’ captains, and collectors which the family knew. The Ark was one of the wonders of seventeenth century London – objects which could be seen at their museum, included the cradle believed to have belonged to King Henry VI, the youngest person ever to succeed to the throne at the age of just nine months. Material from countries across the world, such as shields, shoes, swords, beads and dishes of precious stone could be seen, as well as miniature carvings of amazing skill, executed on cherrystones or plum stones. Rosaries, crystal balls, and religious talismans were also on show in the cabinet, as well as ‘natural history in a nutshell’ – animals and fish which might have been seen by the most well-travelled of the time such as the North American elk, the Arabian gazelle, and the Scandinavian reindeer. Tradescant the Younger promised the collection to a shrewd lawyer and scholar who had helped catalogue the rarities, Elias Ashmole. However in his will Tradescant left the collection instead to his wife Hester, and a court dispute unfurled. Hester lost – although she was allowed to keep the collection during her lifetime. A series of bitter remarks led Ashmole to force her to publicly apologise for her slander, after which he began to spirit the collection away to a house he had bought next door. Hester drowned in her garden pond in 1673. In 1683, boatloads of the Tradescants’ antiquities were travelling down the Thames to Oxford, from the home of Elias Ashmole to their new home, the museum in Oxford which was to bear his name, the Ashmolean Museum. The Tradescants were buried in a tomb which can now be seen in the Museum’s garden. Ashmole himself was also laid to rest at St Mary’s. 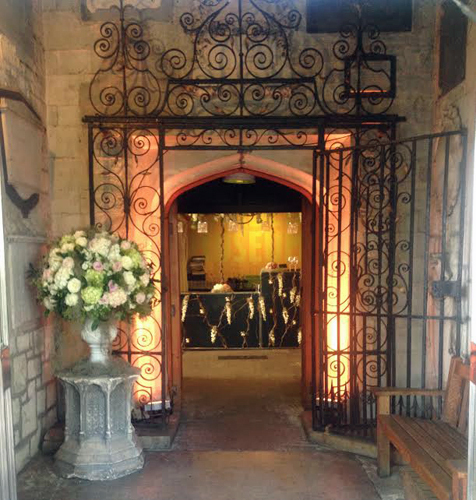 The gate, which is by tradition the Tradescant’s Rose Gate was rescued when the Tradescant’s house, the Ark, was demolished in 1860. A letter from Mrs Agnes M. Macpherson in the Surrey Mirror for November 27th 1942 records that her father, the late Mr William Young, about 60 years ago [ca.1880], saw the old garden walls of the Tradescants being pulled down and the Rose Gate already among the rubbish. ‘He secured this wrought iron gate and had it put up at Stanhill Court, Charlwood, where he lived. The gate is still there’. 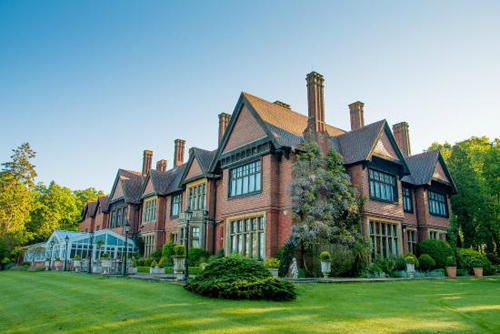 His son, Mr Gordon Young, now lives at Stanhill Court. The tradition that the gate had originally belonged to the Tradescant family was repeated in the sale documents when Stanhill Court was sold in about 1900. I was asked to undertake an analysis of the gate. Taken largely from the website of the Garden Museum.